Although the typical Premier League season includes many twists, turns and talking points, there are always a select few that seem more important than others. This is certainly the case in Liverpool’s season to date, with defender Martin Skrtel’s stoppage-time equaliser at Anfield against Arsenal providing a relevant case in point. Languishing in the bottom half of the Premier League table and having previously dumped out of the Champions’ League by FC Basle, the Reds were trailing seven minutes into injury time when the bloodied defender rose highest to head home a corner. The club have since embarked on a successful run of form, and now sit just four points from a Champions’ League place. 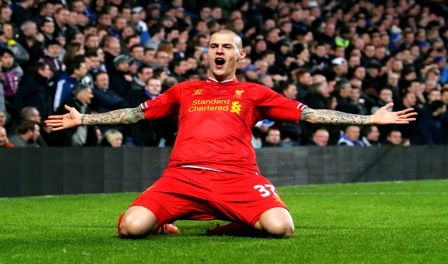 In this moment, Martin Skrtel underlined his importance to the club. Although he is often maligned as being cumbersome and error-prone, he is a courageous defender and one who is capable of inspiring others though example. He was also a rock at the back during Liverpool’s stunning if ill-fated title charge last season, while his considerable threat in the opposition’s penalty area has also earned him a cult following among Liverpool fans. The sight of him persevering after receiving a serious blow to the head against Arsenal only reaffirms this status, and he has become a symbol of the clubs recent resurgence. With the players’ contract due to expire in 18 months, however, the clubs’ board have been forced to enter into new contract talks. Even at 30, he is an integral part of the Liverpool defence and remains first-choice centre back ahead of Dejan Lovren and the veteran Kolo Toure. The poor performances of Lovren have only reinforced the need to keep Skrtel, with the club in desperate need of a strong and reliable defensive leader. Concerns are also growing among fans after the way in which Steven Gerrard’s contract negotiations were handled, with the player admitting that he would have signed an extension if it had been offered in the summer. With the club now unbeaten in five league matches and steadily climbing the table, it is imperative that the club maintain this momentum both on and off the field. Now would therefore be the ideal time to secure the futures’ of Skrtel and young midfielder Jordan Henderson, both of whom have played central roles in Liverpool’s recent improvement. The club is likely to have learned its lesson from the recent episode involving Steven Gerrard, and the odds are that both players will be retained before the end of the January transfer window. Those with a gambling mind-set may want to monitor this and keep an eye on the latest football betting tips from Paddy Power.